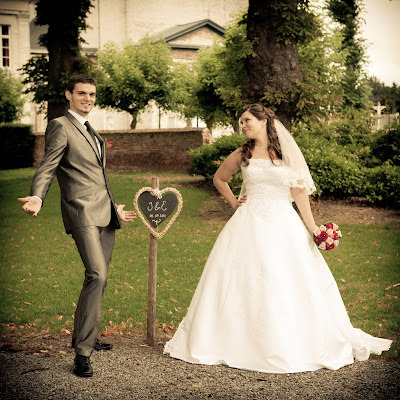 A glimpse of me: 5 months of marriage and PARIS recap!! 5 months of marriage and PARIS recap!! We celebrated our day by giving blood! We try to donate blood on a regular basis, but it has an advantage for Jeff: he gets a day off of work!! So we're both pretty happy now, and we feel like we're heroes too!! Saving people with our blood, hoorah! So to make you guys happy too (especially Joke), here are some pictures of our trip to Paris! The view from our own private studio in Jeff's aunt's appartment in one of the better "quartiers" of Paris! It was so quiet and so beautiful there! On our first night we got tickets from Jeff's aunt to go see a show that's typical of Paris in the Lido. Don't know what that means? Think Moulin Rouge... Maybe slightly more decent... It's kind of a very fancy (and VERY expensive!!) circus in a night club. The next morning we went to go see the Eiffel Tower! My man standing on the Eiffel Tower, looking a tad bit scared! I was glad we could come back down haha! On our last day we went to the Notre Dame. We even went in and there was a service for the first Advent Sunday. We sat on a little bench outside and made little films of ourselves (and the pigeons!). We both filmed a 'resolution' that we'll try to achieve in 5 years time :) I won't tell Jeff's resolution, but I promised myself I'd learn to play the piano! 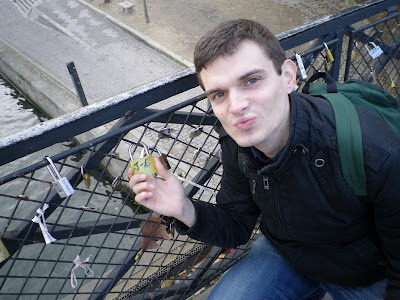 Near the Notre Dame there's a gate with love locks on it... We didn't bring one, we totally stole one! We don't have a Sephora in Belgium so my sweet husband let me choose something!! I hope you enjoyed the little recap! We're already planning a trip back in februari with some friends. We're going to visit a guy that lived in Ghent but he's moved back to Paris! And Jeff's aunt wanted us to come back soon to go to the theatre or the opera with her! LOVE all the pictures, you two look so happy and cute together!! so sweet..congrats and the Paris trip looks amazing! Hi, I came across your blog from Mrs.Pancakes blog. I must admit I am sooo jealous as in January it will be 3 years but for my 5th wedding anniversary I've begged my husband to take me to Paris. It looked like you had a blast!